The findings counter a common explanation for the higher incidence of the injury in women. Previous research had suggested women are more susceptible to ACL tears because their knees move differently, but the Duke team found ACL tears occur the same way in women and men. Led by biomedical engineer Louis DeFrate, Ph.D., the Duke team used a forensic approach to reconstruct injuries by examining bone bruises on the knees of 15 men and 15 women with torn ACLs. Their findings will be published online April 18 in The American Journal of Sports Medicine. The study, while small, is a more rigorous forensic analysis than patient interviews and slow-motion replays of athletes' ACL tears, which other studies have relied upon to understand the injury and possible causes for the disparity between the sexes. Some experts have also attempted to create injury prevention programs targeted at women using video replays as a template. "Based on watching videos of athlete injuries, previous researchers have suggested that females may have a different mechanism of injury than males," DeFrate said. "But it's difficult to determine the precise position of the knee and the time of injury through footage." "We used MRI scans taken within a month of the ACL rupture and identified bruises on the surface of the two large bones that collide when the ACL tears — the femur and the tibia — then used 3-D modeling and computer algorithms to reconstruct the position of the knee when the injury occurred," he said. "Our results suggest that males and females have the same position of injury." Because an ACL tear is such a devastating and often career-ending injury for athletes, sports programs have made considerable efforts to devise strategies for athletes to protect the ACL with strengthening and proper landing techniques, but rates of ACL injury remain high. Beyond the acute injury, a torn ACL also increases a person's chances of developing osteoarthritis at an early age, setting them up for one or more knee replacements in a lifetime. Using advanced imaging and modeling technology, DeFrate's lab has been behind a number of important insights about ACL injury over the past 10 years. Scientists have long held that an inward buckling motion of the knee known as valgus collapse caused the ligament to tear. 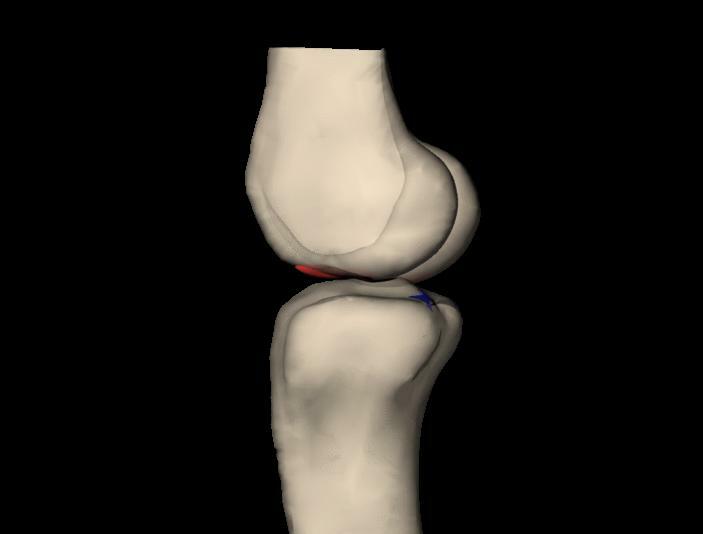 However, using their forensic biomechanics approach, DeFrate's lab concluded in a 2015 publication that landing on a hyperextended knee is actually what tears the ACL. The awkward buckling motion — that gruesome and unnatural angle the knee takes just before the pain registers on the athlete's face — is not the motion that tears the ligament, but occurs just afterward. "In order to develop improved treatment strategies and prevention, we need a clear understanding of what motions are most dangerous for athletes," he said. "This work provides new evidence that landing on an extended knee may be a dangerous position for ACL tears in both males and females." DeFrate's team have also led a series of studies beginning in 2008 that found the most common technique orthopedic surgeons use to reconstruct the ACL often leads them to attach the graft in the wrong spot. "This is like driving a car with the tires out of alignment," DeFrate said. "This causes more severe wear on the cartilage and speeds up the process to osteoarthritis." His research caused controversy among orthopedic surgeons who had used the technique for decades, and he met resistance at academic meetings while presenting his work. But the findings earned him the 2016 Kappa Delta Young Investigator Award from the American Academy of Orthopedic Surgeons, the highest honor given for orthopedic research. He has worked closely with Duke Health orthopedic surgeons, including study co-author William E. Garrett, to review and refine surgical techniques. DeFrate is hopeful that continued study of ACL injuries will lead to improvements in treatment and informed training on how to prevent the devastating injuries, especially in those at highest risk. In addition to DeFrate and Garrett, study authors included Kwadwo A. Owusu-Akyaw; Sophia Y. Kim; Charles E. Spritzer; Amber T. Collins; Zoë A. Englander; and Gangadhar M. Utturkar. The research was supported by the National Institutes of Health (AR066477; AR065527). One author cited the following potential conflict of interest: William Garrett is a consultant and research supporter for Arthrex, DJ Orthopedics, GlaxoSmithKline, and Omeros.